This is the kind of day when you can sit inside looking out at the sunny sky and almost imagine that spring is near. Even the daylight hours are getting longer causing the birds to sing in the mornings. But the fact remains that this is Ohio and it's still winter for a couple of more months. The weather report for tomorrow is calling for a high of 51 degrees F and 60 to 100 percent chance of rain in our area and a whopper of a snow storm in states west of us. I doubt that the proverbial ground hog will see a shadow tomorrow. Yep! It's still winter in Ohio. I really don't have reason to complain since I just got back from a week in Florida visiting my sister. In late December, noticing that I was a little down after the holiday, Rich made the off hand suggestion that I might go visit my sister. He didn't have to say it twice. I found cheap tickets the next day and made the reservation! 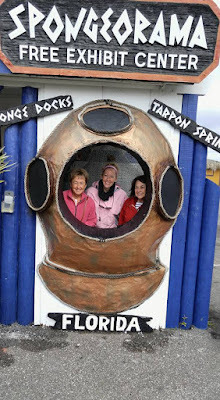 I flew into Punta Gorda where my sister, Laurie, picked me up and we drove north to visit my niece, Anne, in St. Petersburg for a couple of days. Anne and her husband, Drew, were the perfect hosts, allowing us to stay with them in their renovated bungalow. They have done the work themselves and their home is charming. 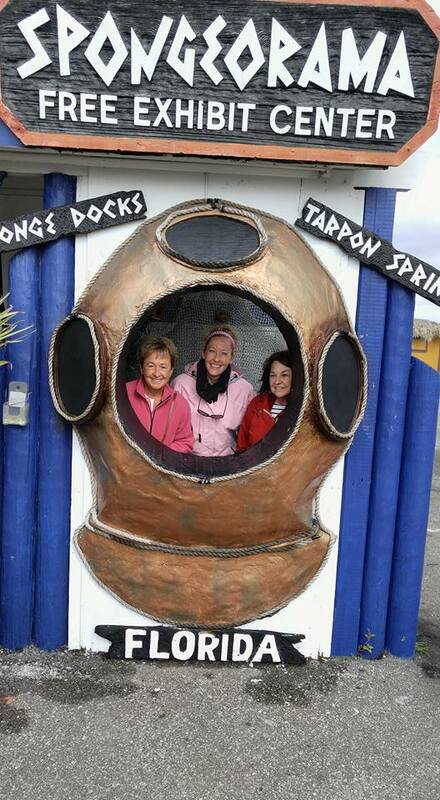 I got to check off one of my bucket list items when we all piled into the car and spent a day in Tarpon Springs. That's the gulf side village where Greek sponge fishermen settled during the 1890s and today it has the largest concentration of people of Greek background of any US city. It was like stepping into a tourist town in Greece where all of the natives were speaking Greek to each other. We met a lovely woman in the Greek import shop who gave me some advice and information to look for when researching my grandfather's background. 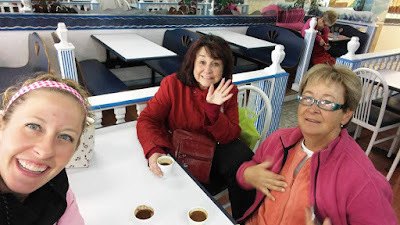 Of course, we dined on a delicious Greek meal in one of the many Greek restaurants. Back in Ft. Myers Laurie's friends were all so welcoming and gracious. 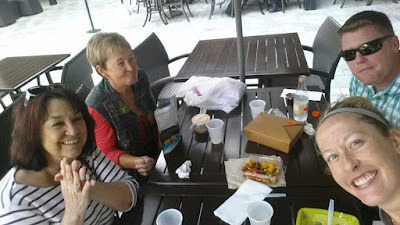 I was entertained at a community lasagna dinner by the lake in her condo complex and later a tapas party with a small gathering of neighbors. Laurie and I did lunch one afternoon with her friend, Gloria, a lovely woman. The afternoon before I came home we went to a charity fashion show/luncheon with 11 of her friends at a country club nearby. Even with all of the social engagements I still had time for yoga on Laurie's upper deck, a few morning strolls about the neighborhood, reading on the lanai and enough shopping to last me until spring arrives in Ohio. The weekend before I left for Florida, Rich and I celebrated our 15th anniversary by spending a night in one of our favorite hotels, The Dearborn Inn, and going to the Henry Ford Museum in Dearborn, Michigan. Like I said before, I really have no reason to complain about the winter. It has been very mild this year compared to the past two years and I have had plenty of distractions. We have been to the Henry Ford several times and still I learn something new each time we go. There is just so much to see. Rich and I were clowning around in one of the children's exhibits and I got him to pose in the giant hot dog bun beside the Oscar Meyer Weiner-mobile. 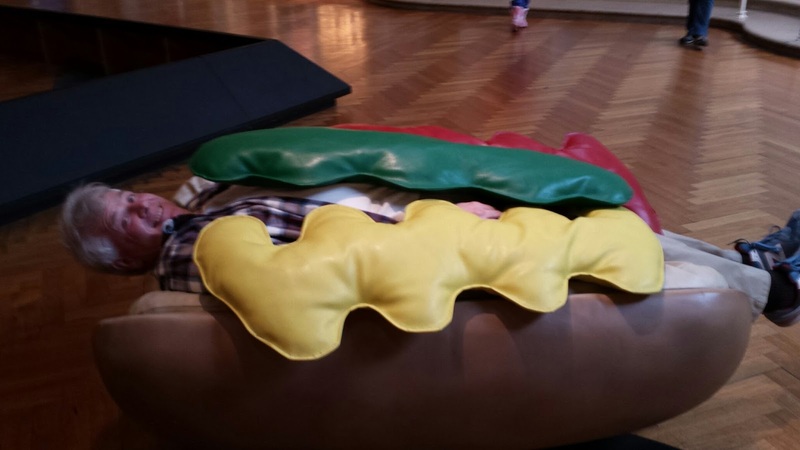 That's one big hot dog! We have noticed that with the longer hours of daylight and the milder temperatures, our two little boys, Mocha and Dionysus, have been feeling frisky. Both of them are kicking up their heels and chasing each other about the pasture. Little Dio has hit that stage in his development where he behaves like a toddler and is unable to walk anywhere. He will suddenly jump and twist in the air and take off running for no apparent reason. Just because he can. They are so cute at this stage and always make me laugh at their antics. Why Didn't I Visit My Sister This Week?